Horses are emblematic of America. Wild horses, from Assateague Island in the east to California in the west, are living descendants of iconic American images. They are living symbols of our pioneer heritage, from wagons crossing the midwest to cowboys crossing the western plains. Horses crossed America before trains did, carried mail before we had a true national postal service, deployed soldiers to protect settlers, and carried many of our ancestors from east to west. Mustangs represent the indomitable individual spirit of the American soul. The most famous car chase ever filmed included a Mustang. We call enlisted men who become officers Mustangs because of their presumed wild and untamed nature. When I was a kid, I was a voracious reader. 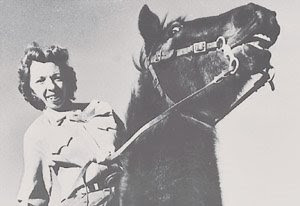 One of my favorite authors was Marguerite Henry, and one of my favorite books was Mustang: Wild Spirit of the West. 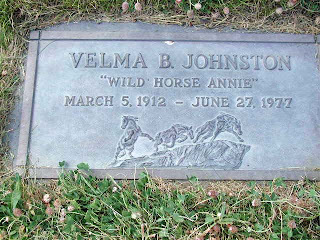 Mustang tells the story of 'Wild Horse Annie' (aka Velma Bronn Johnston), who led the fight to pass legislation prohibiting motorized and aerial hunting of wild horses and burros (the 1959 Wild Horse Annie Act) and to protect wild horses and burros (the Wild Free-Roaming Horse and Burro Act of 1971). It is a story of tenacity and courage, with a bit of community organizing thrown in, and I always loved that it showed how citizens can influence the legislative process in a wholesome 1939 "Mr. Smith Goes To Washington" or 2003 "Legally Blonde 2" kind of way. 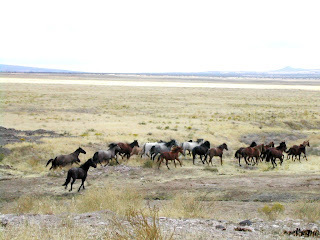 Since 1971, the US Bureau of Land Management (BLM) has been responsible for maintaining and protecting the wild horse and burro population on federal land, and they presently have about 30,000 animals in holding pens. These animals are available for adoption or purchase so long as assurances are provided that they will not be sold or slaughtered. Under 2004 legislation, animals over 10 years of age or which have failed to be adopted three times can be sold without restriction. In July, some 2000 healthy horses were scheduled for euthanasia because of crowding and cost considerations (and perhaps because they occupy land and resources that could be used by cattle). Yesterday, Madeline Pickens, wife of T. Boone Pickens, announced that she and her husband would buy the 2000 condemned animals and were planning on adopting most or all of the 30,000 animals currently held by the BLM. T. Boone may be a blowhard and a rich SOB who wants to make huge profits off green energy the way he did on oil, but this is a great thing to do -- and only the money made on oil makes it possible. Thank you, Madeline and T. Boone. From all of us.